This article is about the river in southern Oregon and Northern California. For the general term, see Klamath (disambiguation). The Klamath is the most important North American river south of the Columbia River for anadromous fish migration. Its salmon, steelhead and rainbow trout have adapted to unusually high water temperatures and acidity levels relative to other rivers in the Pacific Northwest. The numerous fish were a major source of food for Native Americans, who have inhabited the basin for at least 7,000 years. The first Europeans to enter the Klamath River basin were fur trappers for the Hudson's Bay Company in the 1820s; they established the Siskiyou Trail along the Klamath and Trinity rivers into the Sacramento Valley. Within several decades of white settlement, native peoples were forced into reservations. During the latter days of the California Gold Rush, increasing numbers of miners began working the Klamath River and its tributaries, causing considerable harm to the environment. Conflict and introduced diseases left indigenous tribes with only 10% of their original population. Steamboats operated briefly on the large lakes of the upper basin, contributing to the growth of towns such as Klamath Falls, Oregon, before they were replaced by railroads in the late 19th century. In the 19th and 20th centuries, the upper basin became a productive agricultural region, and many dams were built to provide irrigation and hydroelectricity. In the 1960s, the Klamath River was targeted by much larger, but ultimately unsuccessful schemes to augment water supplies in other parts of California. One of these projects, the Klamath Diversion, would have reversed the entire flow of the Klamath River to supply farms and urban areas in central and southern California. Today, the Klamath is a popular recreational river as well as an important source of water for agriculture. It includes many of the longest free-flowing stretches of river in California, including excellent stretches of whitewater. However, dams and diversions in the upper basin have often caused water quality issues in the lower half of the river. Environmental groups and native tribes have proposed broad changes to water use in the Klamath Basin, including the removal of some dams on the river to expand fish habitat. They put forth their concerns in what is now the Klamath Basin Restoration Agreement, a water management plan signed by local communities, governments, tribal groups, environmentalists, and fishermen. The proposal has been endorsed by the U.S. Department of the Interior but has not been authorized by the United States Congress. Upper Klamath Lake, filling a broad valley at the foot of the eastern slope of the southern High Cascades, is the source of the Klamath River. The lake is fed by the Williamson River, which originates in the Winema National Forest, and the Wood River, which rises near Crater Lake National Park. The Klamath River issues from Klamath Lake at Klamath Falls as a short 1-mile (1.6 km) stream known as the Link River, which flows into the 18-mile (29 km) long Lake Ewauna reservoir formed by Keno Dam. Here, the Klamath is connected by the B canal to the Lost River; as part of the federal Klamath irrigation project, the canal is capable of diverting water between the rivers in either direction as needed. Marshlands in the Upper Klamath Basin today are remnants of the vast Lake Modoc. Mount Thielsen in the background. Despite its plentiful flow in California, the Klamath does not supply significant amounts of water to irrigators and municipal users in central and southern portions of the state. The Klamath Reclamation Project in the Klamath Falls area supplies water to local irrigators, and the Central Valley Project diverts water from the Trinity River to supply irrigation water to the Sacramento Valley. Other tributaries of the Klamath, including the Lost and Shasta rivers, are also diverted for irrigation. Water use of the lower Klamath—one of the last relatively free-flowing rivers in the state of California—has been debated for decades among conservationists, tribes, irrigators, and government agencies, and its eventual fate is still unclear. Lower Klamath Lake was formed in the "basin and range" area of the upper Klamath River watershed. The same age pattern is true in the Cascade Range and Klamath Mountains that cover the western half of the Klamath River watershed. As the North American Plate moved slowly southwestward over the past 10 million years, successive oceanic terranes dating from the Cambrian to the late Jurassic were added to the bulk of the North American continent. There are four distinct terranes from west to east. While the coastal mountains date to less than 3 million years ago, the farther inland High Cascades are as old as 7.5 million years. Granite batholiths, overlying sedimentary rock, and volcanic rock were crumpled into the massif of southwestern Oregon and northwestern California. Instead of being diverted southwards, however, the Klamath continued to flow westward and created a steep-walled gorge through the rising range. One of these terranes brought with it a long north–south running band of easily eroded mica that now lies about 30 miles (48 km) inland from the Pacific coast of Northern California. When the Klamath encountered this layer, it began cutting its canyon along the mica instead of continuing southwest to the Pacific, resulting in the sharp northward bend where the Trinity River joins. The lower Trinity also follows portions of the mica and its south fork as well. Semi-nomadic tribes inhabited the upper basin, a portion of which is seen here, with Mount Shasta viewed from Shasta Tribal lands. Klamath River ever since the discovery of gold in its bed has been continuously mined and is still a long way from being worked out. The conditions for river mining in this stream are very favorable. Though carrying a large volume of water, it has nearly everywhere a considerable grade and velocity of current with no great depth ... ... At the present time there are about twenty-five claims being worked on the Klamath and Salmon Rivers, employing three hundred men. Operations in this locality are generally on a small scale and involve the use of but little capital. The remaining water left in the river, whatever the Project is willing to release from Iron Gate Dam, is so little in volume, so hot and so laced with pesticides and nitrates from agricultural waste water that it is often fatal for salmon as much as 100 miles (160 km) downriver. Hundreds of thousands of salmon have been killed in recent years as a result, and Klamath River coho salmon driven nearly to extinction. When the 1864 treaty was signed, the Klamath Tribes, with much less land, became short on the stream water needed for fishing. Although from the 1950s to the 1970s they were not federally recognized, the tribes never lost their water rights, and in 2001, when Klamath Basin farmers twice sued the U.S. Department of the Interior for more access to irrigation water, their rights were upheld. The tribes' water allotments for fishing continue to be a large factor in Klamath Basin water disputes in the 21st century. In 2013, the Tribe's water rights were enforced for the first time, in what is known as a 'Water Call'. The Klamath Tribe called upon their in-stream water right, which was enforced by the Water Master. This resulted in almost all upper-basin irrigation being denied water, except for groundwater irrigators. The Klamath Project, however, was not called upon. A variety of national forests and wildlife preserves—including the Klamath National Forest, Six Rivers National Forest, Klamath National Wildlife Refuges Complex, and Lower Klamath National Wildlife Refuge—are located in the Klamath River watershed. The Klamath National Forest is located in Siskiyou County with a small portion in Oregon, and Six Rivers National Forest is located in the southern Klamath watershed, mostly in the Trinity River watershed. The latter two are located in the Upper Klamath Lake-Lower Klamath Lake area. Lava Beds National Monument, which contains a large array of lava tubes and formations, is also in the Lower Klamath Lake area, to the south of the remnants of the lake. ^ a b "EPA approves historic salmon restoration plan for Klamath River". U.S. Environmental Protection Agency. 2011-01-04. Retrieved 2011-07-28. ^ Source elevation derived from Google Earth search using GNIS coordinates. ^ a b c "Klamath River". Geographic Names Information System. United States Geological Survey. 1981-01-19. Retrieved 2011-07-27. ^ a b "National Hydrography Dataset via National Map Viewer". U.S. Geological Survey. Retrieved 2017-09-24. ^ "Yurok Dictionary: Hehlkeek 'We-Roy". Retrieved 2012-07-07. ^ Rymer, Russ. "Reuniting a River: After fighting for years over its water, farmers, Indians and fishermen are joining forces to let the troubled Klamath River run wild again". National Geographic. National Geographic Society (December 2008). Retrieved 2009-08-21. ^ a b "Klamath River Dam and Sediment Investigation" (PDF). The Yurok Tribe. November 2006. Retrieved 2009-08-21. ^ "Ground-Water Hydrology of the Upper Klamath Basin, Oregon and California". Scientific Investigations Report 2007–5050. U.S. Geological Survey. 2010-04-07. Retrieved 2008-06-29. ^ "Klamath River, OR and CA". American Rivers. Retrieved 2013-08-30. ^ a b Powers, Kyna; Baldwin, Pamela; Buck, Eugene H.; Cody, Betsy A. (2005-09-22). "Klamath River Basin Issues and Activities: An Overview" (PDF). California Department of Energy. Archived from the original (PDF) on 2013-05-23. ^ Durham, David L. (1998). California's Geographic Names: A Gazetteer of Historic and Modern Names of the State. Clovis, Calif.: Word Dancer Press. p. 131. ISBN 1-884995-14-4. ^ "Yurok Tribe: tribal park concept plan" (PDF). The Yurok Tribe. August 2005. Retrieved 2011-07-16. ^ "Water Quality Control Policy for the Enclosed Bays and Estuaries of California" (PDF). California Environmental Protection Agency, State Water Resources Control Board. p. 1. Retrieved 2013-08-18. ^ "Klamath Basin: A Watershed Approach to Support Habitat Restoration, Species Recovery, and Water Resource Planning" (PDF). U.S. Geological Survey. 2007-08-09. p. 1. Retrieved 2015-07-16. ^ North America watersheds (2006) – Commission for Environmental Cooperation (Map). Cartography by CEC, Atlas of Canada, National Atlas, Instituto Nacional de Estadística y Geografía. Commission for Environmental Cooperation (CEC). 2010-12-10. Archived from the original on 2012-10-07. ^ The Columbia River rises in the Rocky Mountain Trench of the Canadian Rockies several hundred miles east of the Cascades, while the Fraser begins in the Rocky Mountain Trench farther north. Both rivers cut through the Cascades to flow to the Pacific Ocean (in the case of the Fraser, the mountains there are called the Canadian Cascades, but geophysically they are part of the same range.) The Klamath's uppermost tributaries begin just to the northwest of the Great Basin, well to the east of the High Cascades. Rivers like the Rogue and Umpqua in Oregon that cut through the Coast Range and begin on the western slopes of the High Cascades should not be confused as cutting through the Cascades although they do flow through the parallel range. ^ "Refuge History: Klamath Basin National Wildlife Refuges". U.S. Fish and Wildlife Service. 2009-04-01. Archived from the original on 2013-06-24. ^ Delong, Jay. "Walking in 100-Year-Old Footsteps in Southern Oregon". North American Native Fishes Association. Retrieved 2009-08-21. ^ "Klamath Lake". Oregon Lakes Association. Retrieved 2012-12-24. ^ "Shasta/Trinity River Division Project". U.S. Bureau of Reclamation. 2011-04-21. Archived from the original on 2011-06-14. Retrieved 2009-08-21. ^ USGS Topo Maps for United States (Map). Cartography by United States Geological Survey. ACME Mapper. Retrieved 2013-10-13. ^ "Historic California Posts: Fort Ter-Waw". California State Military Museum. Retrieved 3 October 2010. ^ a b "Floods on the Klamath River". Klamath Bucket Brigade. Archived from the original on 2017-05-25. ^ "Floods in northern California, January 1997" (PDF). U.S. Geological Survey. April 1999. Retrieved 2011-07-17. ^ Stumpf-Foley, Marcie. "Klamath River Flood of 1997". Gold and Treasure Hunter. The New 49ers. Retrieved 2011-07-17. ^ "Klamath River flood 2005–2006". Happy Camp News. Happy Camp, California: Klamath Design. 2006-01-02. Archived from the original on 2013-07-09. Retrieved 2011-07-17. ^ "11530500 Klamath River Near Klamath, CA" (PDF). United States Geological Survey. 2005. Retrieved July 27, 2011. ^ California Department of Water Resources (January 1965). "Flood!" (161). Sacramento, California: California Department of Water Resources. OCLC 8135568. Retrieved July 26, 2011. ^ "Redwood National Park: Klamath River". ParkVision. Retrieved 2011-07-17. ^ Fox 5 San Diego; CNN Wire (2011-03-11). "California tsunami death: NorCal man drowns trying to photograph tsunami". Hartford Courant. Hartford, Connecticut. Archived from the original on 2013-06-06. ^ Associated Press (2011-03-13). "Man swept out to sea by tsunami was Bend native". OregonLive.com. Retrieved 2013-08-18. ^ "Klamath tsunami victim identified; search comes up empty". The Times-Standard. Eureka, California. 2011-03-13. Retrieved 2015-07-16. ^ "Upper Klamath Basin Ground-Water Study". Oregon Water Science Center. U.S. Geological Survey. 2008-10-31. Retrieved 2009-11-10. ^ Newcomb, R. C. (1958). "Yonna Formation of the Klamath River Basin, Oregon" (PDF). U.S. Geological Survey. Archived from the original (PDF) on 2014-09-03. ^ "Klamath Falls Geologic Map Project". Oregon Department of Geology and Mineral Industries. Archived from the original on 2009-01-05. Retrieved 2009-11-11. ^ Covington, Sid (2004-04-20). "Whiskeytown National Recreation Area Geologic Resources Management Issues Scoping Summary" (PDF). Geologic Resources Division. U.S. National Park Service. Retrieved 2009-11-11. ^ "MSU Archives Collection 219". Minnesota State University, Mankanto. 2009-07-21. Retrieved 2011-07-27. ^ a b Litton, Sabrina (Spring 2003). "A Review of the History of Water Use throughout the Klamath River Basin" (PDF). Center for Watershed Sciences. University of California, Davis. Retrieved 2010-05-19. ^ Darling, Dylan (2005-06-19). "Your land, my land?". Herald and News. Klamath Falls, Oregon. Retrieved 2011-07-27. ^ "High Prairie Creek". Geographic Names Information System. United States Geological Survey. ^ Dunn, R.L (1890). "River Mining". Ninth Annual Report of the State Mineralogist for the year ending December 1, 1889. Sacramento, California: William Irelan, Jr., California State Mining Bureau; State Printing Office. p. 263. Retrieved 2014-11-10. ^ "Gold Mines and Gold Prospecting in California – Region 6". Goldmaps.com. Retrieved 2009-08-22. ^ Hall, Monica; Jenner, Gail. "Early Gold Mining on the Trinity and Klamath Rivers". Klamath Bucket Brigade. Archived from the original on 2014-05-17. Retrieved 2015-07-16. ^ Donnelly, Robert. "Klamath Indian Reservation". The Oregon History Project. Oregon Historical Society. Retrieved 2012-02-08. ^ "Steamboats on Klamath Lake". Siskiyou County Sesquicentennial Committee. Archived from the original on 2011-07-16. Retrieved 2012-02-09. ^ Boyle, John C. "Regulation of Upper Klamath Lake". Klamath Bucket Brigade. Archived from the original on 2015-07-17. Retrieved 2015-07-16. ^ "A brief historical overview of Klamath County, Oregon" (PDF). Klamath Falls, Oregon: Klamath County Museum. 2010-10-01. pp. 2–3, 7. Archived from the original (PDF) on 2013-11-11. ^ Kramer, George (October 2003). "Klamath Hydroelectric Project: FERC No. 2082" (PDF). Portland, Oregon: PacifiCorp. Retrieved 2011-07-18. ^ "Klamath Water v. Patterson". U.S. Court of Appeals for the Ninth Circuit. 2000-01-28. Archived from the original on 2012-03-14. ^ a b c "The struggle to save salmon in the Klamath Basin". The Pacific Coast Federation of Fishermen's Associations. 2008-04-15. Archived from the original on 2009-08-01. Retrieved 2009-08-21. ^ a b Stene, Eric (1994). "Central Valley Project: Trinity River Division". U.S. Bureau of Reclamation History Program. Archived from the original on 2008-05-03. Retrieved 2008-06-29. ^ Barnard, Jeff (2007-02-10). "PacifiCorp willing to build fish ladders". The Daily Triplicate. Crescent City, California. Associated Press. Retrieved 2008-06-29. ^ Becker, Jo; Gellman, Barton (2007-06-27). "Leaving no tracks". The Washington Post. p. A1. Archived from the original on 2008-05-15. ^ "The Truth About Klamath Project Irrigation Water Deliveries in 2001" (PDF). Klamath Basin Coalition Fact Sheet. Klamath Basin Coalition. 2003-05-15. Retrieved 2009-11-12. ^ Taylor, James M. (2002-02-01). "NAS panel investigates Klamath water shutoff". Environment and Climate News. Heartland Institute. Retrieved 2009-11-12. ^ Kovner, Guy (2007-07-09). "Cheney's role in fish kill probed 2002 Klamath River disaster". The Press Democrat. Santa Rosa, California. Retrieved 2014-09-05. ^ "September 2002 Klamath River Fish-Kill: Final Analysis of Contributing Factors and Impacts" (PDF). Pacific Coast Federation of Fishermen's Associations. July 2004. Archived from the original (PDF) on 2008-12-19. Retrieved 2009-08-23. ^ "USGS Gage #11512500 on the Klamath River below Fall Creek near Copco (Average Annual Streamflow)" (1924-01-02 to 1960-12-01). National Water Information System. United States Geological Survey. Retrieved 2009-08-23. ^ a b "Action plan for the Klamath River total maximum daily loads and Lost River implementation plan" (PDF). California Environmental Protection Agency, State Water Resources Control Board. March 2010. pp. 1–2. Retrieved 2011-07-28. ^ "Klamath River, Oregon". National Wild and Scenic Rivers System. Retrieved 2013-07-10. ^ Foster, Doug (2002). "Refuges and Reclamation: Conflicts in the Klamath Basin, 1904–1964" (PDF). Oregon Historical Quarterly. Oregon Historical Society. 103 (2): 150–187. Retrieved 2008-06-29. ^ "Restoring Balance to the Klamath Basin". Oregon Wild. Retrieved 2008-06-29. ^ "Klamath Project". U.S. Bureau of Reclamation. Archived from the original on 2008-03-11. Retrieved 2008-06-29. ^ Whitney, David (2007-08-12). "Discord threatens Klamath River water talks: Refuge farms "a deal-killer"". Sacramento Bee. p. A4. Archived from the original on 2007-09-13. ^ Support of Tribal Nations and Call for Removal of Dams Along the Klamath River. ^ Barnard, Jeff (February 19, 2010). "Klamath Basin deal helps farmers, fish". The World. Associated Press. Retrieved 2011-07-27. ^ "Proposed Klamath River Basin Restoration Agreement for the Sustainability of Public and Trust Resources and Affected Communities" (PDF). 2008-01-15. Archived from the original (PDF) on 2008-02-16. Retrieved 2008-06-29. ^ a b Unkefer, Charlie (2008-11-20). "'Historic' dam removal decision". Mount Shasta Herald. Mount Shasta, California. ^ Yardley, William (2011-07-30). "Removing barriers to salmon migration". The New York Times. p. A10. Retrieved 2011-07-30. ^ Barnard, Jeff (2012-12-31). "Parties renew Klamath Basin accord". The Register-Guard. Eugene, Oregon. Associated Press. p. B2. Archived from the original on 2013-02-16. Retrieved 2013-01-02. ^ Barnard, Jeff (2013-04-04). "Remove all four dams on the Klamath River, environmental analysis recommends". The Oregonian. Associated Press. Retrieved 2013-04-05. ^ "Klamath Tribes' water rights". The Klamath Tribes. Archived from the original on 2011-07-21. ^ "Klamath Tribes assert water rights, shutting off irrigation to some ranchers". The Oregonian. Associated Press. 2013-06-13. Retrieved 2013-07-10. ^ "Saving the Klamath River: An Interview With Fly Fishing Guide Craig Nielsen". California Trout. Retrieved 30 March 2012. ^ Bacher, Dan (2009-03-24). "Klamath Riverkeeper Joins Suit to Stop Harmful Recreational Gold Mining" (PDF). Klamath Riverkeeper. Retrieved 2009-08-22. ^ "Suction Dredge Permits". California Department of Fish and Game. Retrieved 2015-07-16. ^ "The Yurok Tribe's Klamath Salmon Festival". www.yuroktribe.org. Retrieved 2016-03-02. ^ Thornton, Stuart (2014-01-01). Mendocino & Redwood Country. ISBN 9781612389813. Blake, Tupper Ansel; Blake, Madeleine Graham; Kittredge, William (2000). Balancing Water: Restoring The Klamath Basin. Berkeley, California: University of California Press. ISBN 978-0-520-21314-2. OCLC 247677277. Board on Environmental Studies and Toxicology (BEST); Water Science and Technology Board (WSTB) (2008). Hydrology, Ecology and Fishes of the Klamath River Basin. Washington, D.C.: National Academies Press. ISBN 978-0-309-11507-0. OCLC 190778059. Bright, William (2004). Native American Placenames of the United States. Norman, Oklahoma: University of Oklahoma Press. ISBN 978-0-8061-3598-4. OCLC 53019644. Durham, David L. (1998). California's Geographic Names: A Gazetteer of Historic and Modern Names of the State. Clovis, California: Word Dancer Press. ISBN 978-1-884995-14-9. OCLC 38389700. Grinnell, Joseph; Dixon, Joseph S.; Linsdale, Jean M. (1937). Fur-bearing Mammals of California: Their Natural History, Systematic Status, and Relations to Man. 2. Berkeley, California: University of California, Berkeley. OCLC 1836075. Hittell, Theodore Henry (1897). History of California. 3. N.J. Stone. Irwin, William Porter; Snoke, Arthur W.; Barnes, Calvin G. (2006). Geological Studies In The Klamath Mountains Province, California And Oregon. Boulder, Colorado: Geological Society of America. ISBN 978-0-8137-2410-2. OCLC 70407916. Mackie, Richard Somerset (1997). Trading Beyond the Mountains: The British Fur Trade on the Pacific 1793–1843. Vancouver, British Columbia: University of British Columbia (UBC) Press. ISBN 978-0-7748-0613-8. OCLC 82135549. McArthur, Lewis A.; McArthur, Lewis L. (2003) . Oregon Geographic Names (7th ed.). Portland, Oregon: Oregon Historical Society Press. ISBN 978-0875952772. National Research Council (NRC) (2004). Endangered and Threatened Fishes in the Klamath River Basin: Causes of Decline and Strategies for Recovery. Washington, D.C.: National Academies Press. ISBN 978-0-309-09097-1. OCLC 54280138. Palmer, Tim (1993). The Wild and Scenic Rivers of America. Washington, D.C.: Island Press. ISBN 978-1-55963-145-7. OCLC 26586845. Powers, Dennis M. (2005). The Raging Sea: The Powerful Account of the Worst Tsunami in U.S. History. New York, New York: Citadel Press. ISBN 0-8065-2682-3. OCLC 57588825. Reisner, Marc (1986). Cadillac Desert. New York, New York: Viking Press. ISBN 978-0-670-19927-3. OCLC 13423435. U.S. Coast and Geodetic Survey (UCGS) (1951-06-02). United States Coast Pilot: Pacific Coast (7th ed.). Washington, D.C.: U.S. Government Printing Office. OCLC 54088263. 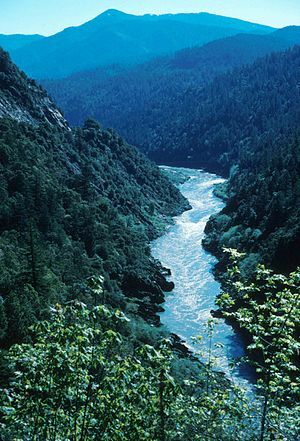 Wikimedia Commons has media related to Klamath River. State of California hydrological monitoring of the Klamath and tributaries.